The Lodge of Ancient, Free and Accepted Masons, and often referred to as the “Blue Lodge” is the foundation of all the orders within the Masonic Family. It represents Freemasonry, itself, from which all other recognized Masonic organizations have arisen. It is the world’s oldest and largest fraternal organization. It has no regard for differences in a person’s race, color, creed or station in life. Its history and traditions date from antiquity. It has two purposes: first to inspire its members to live by the tenets of Brotherly Love, Relief and Truth, and, second, to join its members in the endeavor to build a world where justice, equality, and compassion shine forth in the happiness of all human kind.While the moral philosophy of Freemasonry is founded upon religious principles, it is not a religion nor a substitute for one. It does not solicit membership but welcomes men who have good morals and who profess a belief in a Supreme Being. Any man sincerely desirous of serving humanity only needs to ask a member in order to receive a petition for membership. When a man asks to join a Masonic Lodge, he enters into an opportunity for personal development, character building, and the acquisition of leadership capacities. Through his Masonic journey and his association which his brethren provide, a mason learns the skill and finds the understanding with which he can enhance his community and strengthen his family. Much of the structure of the Masonic Fraternity is modeled on the medieval guilds of stone masons who constructed the magnificent cathedrals in Europe during the middle ages. Similarly, a great deal of modern Freemasonry’s moral symbolism draws from the art and science of these builders. Much the same as these master workmen labored to build an expression of a communitys faith, so Freemasons today labor within their communities to make them a finer place to live.While our earliest Masonic documents date from the close of the thirteenth century, present Masonic practice and structure emerged some three hundred years ago when lodges of masons began to accept men of prominence and learning who were not stone masons. In 1717, four lodges in England met and formed the first Grand Lodge with a Grand Master at its head. When Maine became a state in 1820, the lodges within its borders formed the Grand Lodge of Maine and elected Maine’s first governor, William King, as the first Grand Master. Today there are 191 lodges in Maine, with a total membership of approximately 25,000 Freemasons. Since 1762 when the first lodge was formed in Maine, Freemasons have been active in promoting education, supporting stronger communities and practicing charity. This proud tradition continues through a wide range of community betterment programs, through drug abuse prevention, scholarships, out-reach efforts to the sick and needy, and a child identification program. Perhaps the civic service of Freemasonry to our communities is in no place more clearly evident than the laying of the cornerstones of public buildings. In this ceremony, Freemasonry reminds itself and all citizens of the moral convictions and dedication to others which are necessary to any well ordered and compassionate society. Probably there is no other Masonic order more closely associated with the symbolic or Mother Lodge than the Capitular Chapter of Royal Arch Masons. In fact, the fourth and final Degree of the present Capitular Degrees as conferred in the Chapters, that of Royal Arch Mason, was formerly a Degree of the Lodge for which only actual Past Masters were eligible. This Degree was taken from the Lodge system as practiced in the Old World from which it originated when the first Chapters were organized in the early 18th Century in our country. This Degree along with the Mark Master’s Degree and two others comprise Capitular Masonry as it exists in our modern day. Some of the lessons taught in the philosophy of the symbolic or “Blue Lodge” can be better understood and appreciated if experienced with the supplementary information involving the Ancient Craft Masonry of the Old Testament Era of the Bible, as portrayed in both the Capitular Degrees of the Royal Arch Chapter and the Cryptic Degrees of the Council of Royal and Select Masters. The Grand Chapter of Maine, Royal Arch Masons was organized in 1821, the year after the formation of the Grand Lodge of Maine, A.F.& A.M. 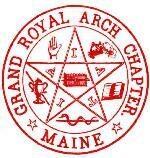 It is interesting to note that many of our Grand Masters of Maine have also served the Grand Chapter. At present there are 54 working Chapters. On a national level, Royal Arch Masons support a project or philanthropy known as Royal Arch Research Assistance, and abbreviated “RARA”. The purpose of this research is to determine the reason that some individuals, particularly children, experience learning difficulties through a disorder of the inner ear, which does not properly transmit sounds to the brain so that it may correctly interpret them. The resulting conflict in hearing by children who experience this disorder leads to both learning and behavioral difficulties. Progress is being made through research, but it is a complex process requiring much research before perfecting a complete cure. Our Maine Royal Arch Masons can be very proud of the fact that we rate very high on the national scale in our contributions to this most important research. On our State level, the Grand Royal Arch Chapter of Maine recently developed a scholarship program in which high school students who plan on continuing their education are awarded four year Scholarships. Four of these are presently being awarded annually. Maine Masons realize the importance of education in our complex world. The Grand Council of Maine which was formed in 1855 is composed of 17 Councils encompassing the entire State. The work of the Council consists of three of the most exquisite and ornate degrees in all of Freemasonry and completes the Masonic Story in a way that brings all of the previous Degrees together. The Royal Master and Select Master Degrees expand upon the events surrounding the Master Mason and Royal Arch Mason Degrees and not only give greater meaning to them, but also illustrate most beautifully the precepts of loyalty, faithfulness and perseverance. The drama of the Super Excellent Degree depicts the dire consequences of perfidy and infidelity. The main charity of the Grand Council of Maine is the General Grand Council Benevolent Fund which supports medical research into cardiovascular disease. The Commandery has had a long and interesting history. Although written records date back only to the mid 1700s, scholars believe they can trace the organization back to the Crusades. One of the Orders of the Commandery is “The Order of Malta”. This the scholars believe to be descended from those early Knights of Malta. They were organized to protect the pilgrims who were traveling to Jerusalem. Eventually they were driven out of Jerusalem by force and ended up on the Island of Malta. Later, being forced from there, they were welcomed in Italy and Germany until once more they were forced to move on and the Order was suppressed with each Knight going his own way until the Order reappeared. The Knights Templar were also formed to protect the pilgrims. History tells us that they, too, eventually were driven from Jerusalem and were forced to retreat back to Europe. In like manner, they, too, had to disburse and hide from harsh rulers. Scholars are of the belief that many of these Knights escaped and carried the secrets of the Knights Templar with them to one day be resurrected. The Knights Templar represent Freemasonry from the background of the New Testament era of the Bible. It is the change from the time of Ancient Craft Masonry to that of Christian Masonry, and thus “Every Christian Mason should be a Knight Templar”. The earliest recording of Knights Templar in the U.S. dates back to 28 August 1769 in Boston, Massachusetts. The organization began to flourish and we learn that an Encampment of Knights Templar (today known as a Commandery) was organized in South Carolina. Other Encampments then followed. On 21 June 1816, the General Grand Encampment of Knights Templar of the United States of America was organized. The Commanderies of Knights Templar support two philanthropies, The Knights Templar Eye Foundation and the Educational Loan Foundation. The first, which is organized through the Grand Encampment, deals with the correction of eye problems, as experienced by both children and adults. These are the types of vision handicaps which can be corrected through surgery. The second philanthropy is providing financial assistance to students through low interest loans which do not have to be repaid until after the student has graduated. Some Grand Commanderies have their own special projects to help others. For example, our own Grand Commandery has a special foundation for providing financial assistance to students in a vocational school program. Visit the York Rite of Maine web site. The Ancient Accepted Scottish Rite of Freemasonry in Maine consists of thirty two degrees. The first three degrees are those of Blue Lodge Masonry or the three degrees of a Master Mason. The other twenty-nine degrees are divided into four bodies known as Lodge of Perfection (4 through 14); Council, Princes of Jerusalem (15 and 16); Chapter of Rose Croix (17 & 18); and Consistory (19 through 32 degrees). In Maine there are five Valleys, named for the Districts of Scottish Rite, located in Auburn, Augusta, Bangor, Portland, and Rockland. The Valleys in Auburn, Augusta, Bangor and Rockland are three body Valleys, each, consisting of a Lodge, a Council, and a Chapter, while Portland is a four body Valley which includes Maine Consistory. Scottish Rite Masonry continues the teaching of the three basic Masonic Degrees. Each degree from 4 through 32 adds more light, more knowledge and more symbolism to the lessons of Freemasonry. It is a wonderful fraternity of Masons dedicated to charity, truth and loving kindness. The charitable endeavor of Scottish Rite is one of its great strengths. They support the Museum of Our National Heritage in Lexington, Massachusetts. It is a museum free to all and open to the public daily, with some permanent and some alternating exhibitions containing items of historical interest to all people. They also support Schizophrenic Research and have contributed millions of dollars for the study of this dread disease. The third charity they support is the Abbott Scholarship Program which annually supplies $11,000 fo scholarships in Maine. The most recent and far reaching of the charities of the Scottish Rite are the Masonic Children’s Learning Centers for the tutoring of children afflicted with dyslexia. There are Centers in Bangor and Portland. The governing body of the Scottish Rite in Maine is the Maine Council of Deliberation whose headquarters is located in Portland. It meets annually to review activities of the previous year and to plan for the succeeding year. Its annual session is rotated among the five Valleys in Maine. Maine Scottish Rite is part of the Supreme Council of the Northern Masonic Jurisdiction of the United States, which consists of the fifteen States east of the Mississippi River, North of the Ohio River and the Mason-Dixon Line, including Delaware. The Ancient Arabic Order, Nobles of the Mystic Shrine has a rich and illustrious history. The first Shrine Temple was organized in 1872 in the New York City Masonic Hall and called Mecca Temple. Initially, it was formed as a fraternal order in which Masons could join together in fellowship and fun. Its North American membership numbers about 600,000. Maine has two Shrine Temples: Anah in Bangor and Kora in Lewiston. The area from which Anah Temple draws its membership includes Waterville and the balance of the State to the north and east, while the remainder of the area of south and west comprises the jurisdiction of Kora Temple. At the heart and soul of the Shrine are the Shriners’ Hospitals for Children. The first hospital was opened in 1922 and there are now 22 hospitals across North America. The hospitals serving Anah and Kora territories are in Springfield (Orthopaedics) and Boston (Burns) in Massachusetts. Recognizing the need of treating severely burned children, the Shrine opened its three Burns Hospitals in the mid-1960s. In the early 1980s the Shrine founded its Spinal Cord Injury Units in three existing Shriners Hospitals. The hospitals have a three-fold purpose: to help children, to conduct research, and to train medical personnel. All care for treatment at Shriner’s Hospitals is totally FREE of charge to the patients and their families. Assistance with transportation, meals and accommodations may be provided on an as-needed basis. With a total budget exceeding $420 million annually, where does all of this money come from? It is derived from gifts, bequests, annual member dues and fund raising events. As a Noble of the Shrine fraternity, you can be a part of this great philanthropy, helping thousands of children each year. “No man ever stands so tall as when he stoops to help a child”. The Order of the Eastern Star is the largest fraternal organization in the world to which both men and women may belong. It provides an organization where those with high moral character, a desire to work for the betterment of others and a drive to make the world a better place can contribute their time, energy and wisdom to our Order for the good of all mankind throughout the world. members either active for three (3) years or majority of the International Order of the Rainbow for Girls or of the International Order of Job’s Daughters, each of whom shall have attained the age of eighteen. And of course Master Masons may become members. It’s a fantastic way for a husband and wife to be involved together. Governed internationally by General Grand Chapter, there is a Grand Chapter of Eastern Star here in Maine that governs the subordinate or local Chapters. There are currently sixty-four chapters in Maine with approximately 6,000 members. The Order of the Eastern Star in Maine supports the Order of Rainbow for Girls. They also provide scholarship assistance to students entering the field of Religious Education through an ESTARL program. They support Cancer Research, Heart Research, the Shrine Hospitals, Knights Templar Eye Foundation, The Children’s Dyslexia Centers, DeMolay, and many other local charities. Eastern Star is a way of life. It is a social order comprised of persons with deep religious convictions and spiritual values, but it is not a religion. We are related to our Masonic Brothers by our affiliation and together we strive to support and help each other. Information may be obtained by contacting Rheanne E. Frost, Grand Secretary at PO Box 459, Peru, ME 04290 or by email rheannefrost@gmailcom. Maine Eastern Star’s website is here. In Maine there is only one White Shrine which is located in Auburn. It is Rugged Cross Shrine, No. 2, and meets on the fourth Friday of each month, July and August excluded, at the Masonic Temple located at 1021 Turner Street. Masons and women with Masonic relations may join by filling out an application from a White Shrine Member or Shrine Scribe (Secretary). A visit from the Shrine representative will be made and a vote for admittance taken. Daughters of the Nile enjoys its heritage from the Ancient Arabic Order of the Nobles of the Mystic Shrine and are pleased to have the support and interest of the local Shrine Temples, as well as that of the Imperial Shrine. Membership in the Order is gained by being proposed for the same. Petitions for membership by individuals are not accepted. The International Order of the Rainbow for Girls is an organization for young women between the ages of 11 and 20, regardless of race, creed or color. A girl is recommended by another member, or by a member of the Masonic Lodge, Order of the Eastern Star or Amaranth. Masonic heritage is not a requirement for membership. Parents are invited and encouraged to attend meetings and activities. Founded in Oklahoma in 1922, Rainbow currently has Assemblies in 46 States and 8 foreign countries. The initiation ceremony of Rainbow is an inspiring and colorful one. The meanings of the Rainbow of colors are explained and Rainbow Girls are responsible for conducting all business and planning all activities of their Assembly. While adult advisors are always available to provide guidance, stability and interpret rules, the Order believes that a girl benefits most when she is given a “hands-on” experience so that all major decisions are made by the members of the Assembly through their regular order of business. The underlying goal of Rainbow is to teach a girl the importance of being a good citizen and to reinforce the differences between right and wrong. By participating in planned activities, a girl begins to practice the values that she is taught in Rainbow. By participating in service projects, she learns first-hand the pleasure of helping those less fortunate. Through fund-raising projects, she learns the importance of generating revenue and helping the Assembly meet its expenses. Fun activities and visitations provide the members an opportunity to relax, experience something new, and make new friends. Rainbow is dedicated to helping young women develop leadership, positive character strengths, and other important life skills. Rainbow makes a difference in a girl’s life and Rainbow Girls make a difference in the lives of those around them. Maine DeMolay’s website is here.